Steelheart was different from my usual YA reads but I loved it. The action started on the very first page and didn't let up for the entire book. It made for a very fast-paced and exciting read! The premise of the Epics: ordinary people who developed superpowers after Calamity (I'm still not sure but I think Calamity was a star), was really interesting. I liked how there were lots of Epics, all different kinds, and not just one person with a superpower. The idea of the Epics ruling America was terrifying. Sanderson's world-building was perfect: he wove the history of the Epics into the story, so there were no slow parts at the beginning of the book. David wants to kill Newcago's (previously Chicago) ruling Epic: Steelheart. Steelheart's name depicts his powers: he is strong, invincible, and can turn things to steel. He turned all of Chicago to steel in what's called the Transfersion. The imagery describing the cold, dark, gray Newcago was exceptional. Not only is Chicago now made of steel, another Epic called Nightwielder has turned Newcago into a state of permanent darkness. What a bleak, scary place to live! Anyone who offends the Epics (there are several ruling under Steelheart) in any way is killed. The Epics are in complete control of the city's resources and people. David has devoted his life to studying the Epics and devising plans to kill them. Steelheart killed David's father and David wants revenge. He learns of the Reckoners, a group devoted to killing Epics, and wants to join them. The Reckoners come to Newcago and David devises a plan to meet up with them. I enjoyed the camaraderie of David and the Reckoners. They were a devoted, loyal team and I liked that they joined together and David found his purpose in that way. But what made Steelheart so great were the plot twists throughout the story. Every time I thought I knew where Sanderson was taking the plot, things would change and I was continually surprised. I love that! The characters were very well-developed, and I grew to care about the Reckoners, more than I expected to. I often find character development lacking in sci-fi, but not so in Steelheart. My one complaint about Steelheart was that there was more fighting than I personally like, but it did fit the story. The fight scenes were long yet well-depicted. I think they would appeal more to the male readership than they did to me. 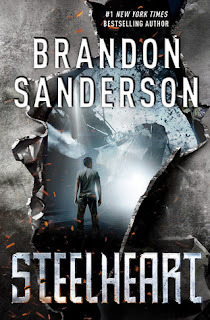 Overall, I loved Steelheart and look forward to the next book in the series. Sanderson ended the book with a big surprise and I'm really excited to see what happens next in book two!